Buying pull toys for toddlers is like entering into a whole new world. It’s not just the little red wagon anymore. 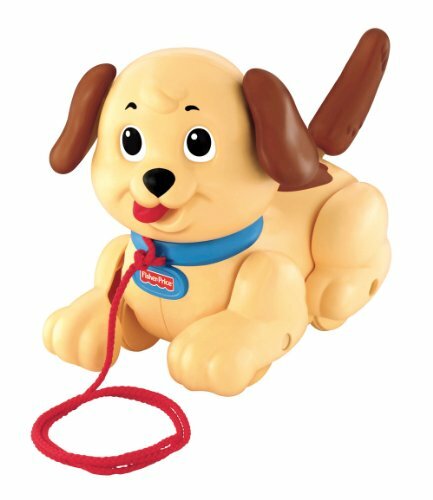 You can get pull toy animals like quacking ducks, dancing alligators, and of course the cute little puppy. 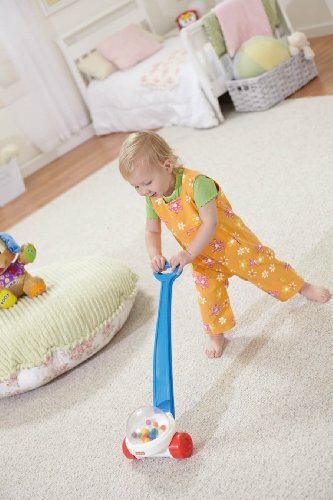 Pull toys help toddlers develop hand-eye coordination and encourage exercise and fun all at the same time. 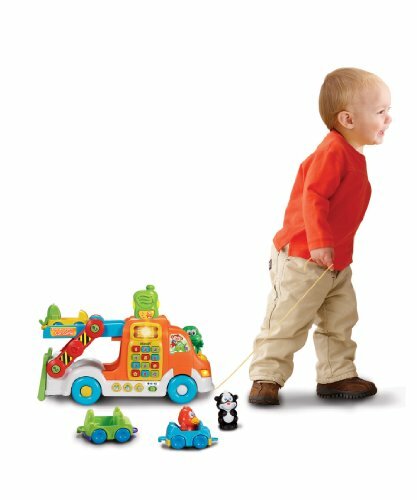 Your toddler will develop a great relationship with their colorful new pull toy and it will be the go to toy for hours of imaginative play and fun. This is a great first imaginary pet for your toddler. When Lil snoopy gets pulled, his head turns and his ears wiggle. 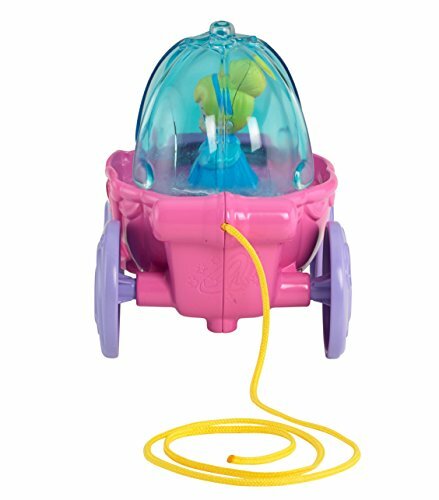 No batteries are needed and this fun pull toy will help to develop the little ones fine and gross motor skills along with their imagination. Recommended age is between one and three years. The Fisher-Price Corn Popper is a classic toy that has been entertaining toddlers for many years. The colorful balls strike the plastic dome and create a poppity-pop sound and action. It encourages walking, visual stimulation and counting. It has a sturdy base and easy-to-grasp and push handle to help steady and encourage new walkers. Best for 1-3 year olds. What toddler won’t enjoy a dancing alligator? Made by PlanToys who are leaders in green manufacturing and production. They are the first company to manufacture toys using wood from rubber trees that no longer provide Latex. This is a great pull toy to aid in learning and physical development. For aged 19 months to 3 year olds. While being pulled, the wooden pieces make rhythmic click-clack sounds. This is a multi-function playset to get your toddlers thinking and learning as well as being active. It is designed for toddlers between one and three years of age and is an interactive educational toy as well as a pull toy. It comes with 3 interactive animals and 3 interactive vehicles that can be loaded by using the flip down ramp. It is also electronic and features a removable CB radio that introduces colors, numbers and musical learning. Colorful fun that will keep the kids busy, learning and entertained for hours a day. 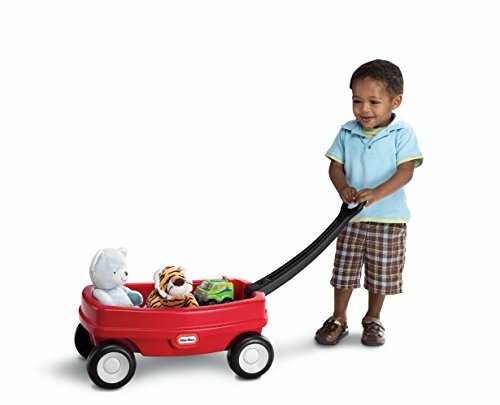 This pull toy wagon is designed for indoor and outdoor play and the wheels provide protection for indoor surfaces. The handle folds flat for easy storage. Let your kids load up the wagon with imaginary friends and animals and go for a backyard adventure. Built to last and the body will never rust. 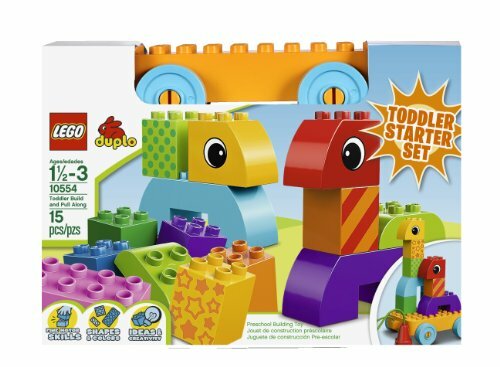 The Lego Duplo build and pull along is a combo toy that includes creative building and pull along action for your toddler. It includes a collection of 15 brightly colored bricks and elements and a pull along wagon. Great for developing creative thinking and problem solving with it’s construction feature. These extra large elements are fully compatible with standard DUPLO bricks and elements. 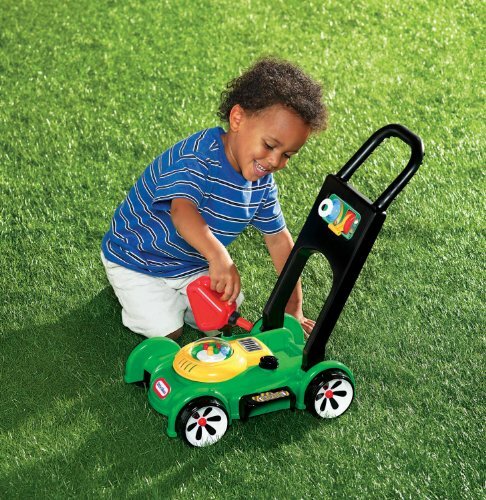 This is a great starter pull toy that will grow with your baby. The rolling wheels activate music, sound effects and phrases for learning. This fun Disney themed toy is colorful and encourages curiosity and imagination as well as developing sensory and motor skills. 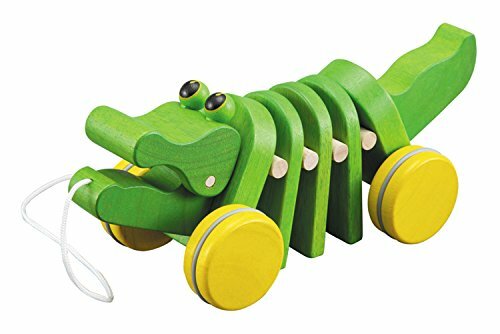 Your toddler can start off by using this as a sit and roll toy graduating to pushing and crawling and finally as a stand walk and pull along. No batteries needed for this mower, the sounds are mechanical. Push the mower and the beads pop and pull the cord to hear engine sounds. Lots of extras with this push toy including a removable gas can, clicking key and movable throttle. Great for exercise and role play. Their love for mowing just may come in handy in a few years. Recommended for ages 18 months and up. 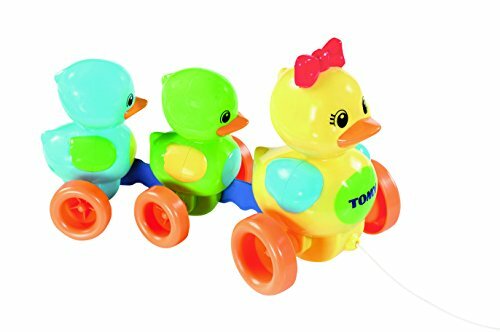 This is a building and pull toy set with three interlocking, mix and match animals on wheels. 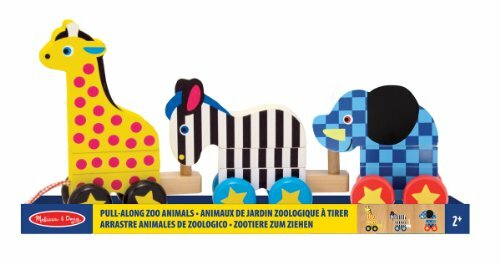 This quality wooden toy provides colorful fun and interactive play that features an elephant, zebra and a giraffe. Great for problem solving, hand-eye coordination and imaginative play. Recommended for two years and up.